It’s been more than a year since we began working on our house. Now, it’s done. I guess you can never say your home is done because there’s always something more you want to do to it. But for now, the Green-Grossfield house project is done. We moved into the house in December, a week before our wedding, while we finished the inside. We had been living amidst snow, dirt, and weeds ever since. It’s time for some landscaping. 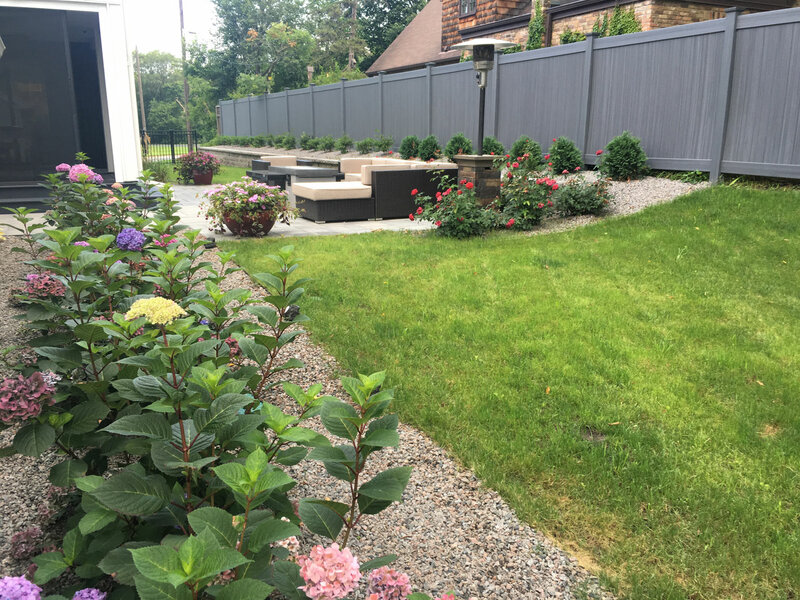 We asked our landscape designer Diana Grundeen with TRIO Landscaping to stay true to the modern clean lines of the house. Our goal was zero maintenance. Since we wanted mostly hardscape we chose the pavers first. Marc and I fell in love with the Melville pavers in gray, the perfect color, shape and style for the house. They are from Belgard and locally produced by Anchor Block, a Minnesota company, so we based our plan around them. We did a large walkway and driveway apron in the front of the house and a paver patio in the back. We needed to put in a retaining wall, since the tiny backyard was sloped, and we wanted to maximize our living space. That living space was created with the help of two decks. We used composite decking material for both. One deck spans the north wall of the house overlooking the park and Cedar Lake. The other is under our son’s cantilevered bedroom and off the kitchen, and is now an outdoor dining area. It leads out to the paver patio, awesome Uptown Fire Table, and seating area that we are plopped in nearly every night it’s warm. The Vrienden furniture is not just from a local company, but it’s perfect for our style. The low-profile seats have cushions that dry almost instantly after a rain. I wanted red; Marc wanted gray. I won on the north deck; he got the backyard. We buried two gas lines for the grill and the firetable, which makes cooking and entertaining so easy… no propane to lug or run out of! We also screened in the dining deck (we motorized the screens for Marc’s enjoyment) so we don’t have to share our meals with bugs! Picking plants was a challenge because we insisted on low maintenance (I have a brown thumb). We also wanted a modern look, which Bailey Nurseries helped us create. We chose Endless Summer hydrangeas, Easy Elegance roses, and many First Edition plants. We also invested in an irrigation system to keep them watered… remember… brown thumb. There are drip lines for all the plants, and they are growing beautifully! Even the grass stays green. Our final decision was lighting. Angular pathway lighting became a perfect front-walk accent and uplighting the front of the house accented the architectural wings we designed for a dramatic feel. Light also shines through the garage door glass, which warms up the house at night. We love spending time outside our house. 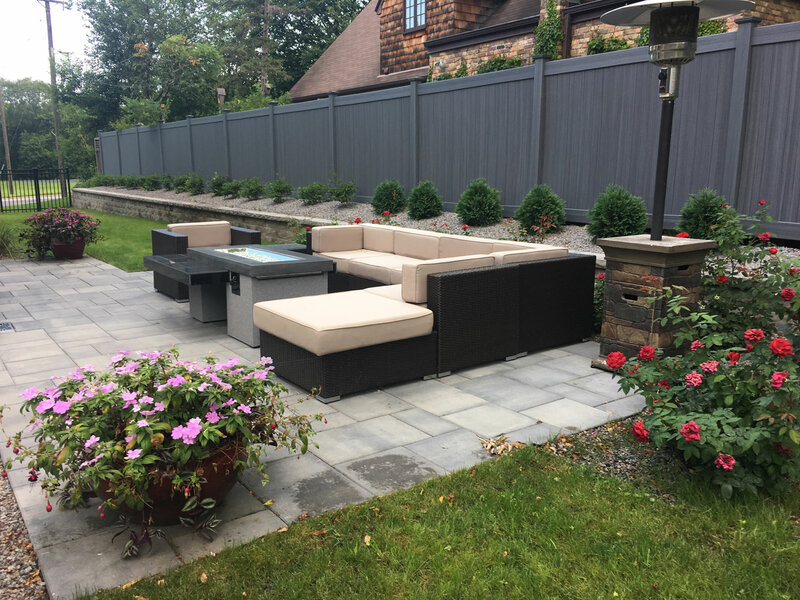 There is tons of space for entertaining and relaxing, and we don’t spend the summer weeding or watering. The only thing our landscape is missing is a pool and a putting green, but that’s for the Green-Grossfield Project Phase 2. I guess you’re never really done with a house! Thank you for sharing this journey with us, now come see it in person during Midwest Home’s Luxury Remodeling Tour! Previous articleGo For The Gold (Home Accessories)!